3. She wrote "Egregious poems in High School." Also, we learned that she makes us laugh, as well as making us want to read 100 more of her books. We had so much fun this month! Jennifer Donnelly was inspired by an actual crime when she wrote A Northern Light. In 1906, a woman went missing and was found murdered in the Catskills Mountains of New York. If pitching in on a search and rescue (SAR) team sounds like something you're suited for, check out the National Association for Search & Rescue website. They offer loads of classes and conferences throughout the U.S. to train volunteers - usually ages 15 and older. You can also contact your local police department, as many communities have SAR programs and welcome all the help they can get. I Heart Daily Bloggie Nominee! I Heart Daily is up for a Bloggie in the category of Best Group Weblog! You can vote for them easily. Voting closes on Monday, February 2, so don't delay! Congrats to Melissa and Anne! RED Hearts, the first-ever national trendspotting service for teens by teens, launched last week on I Heart Daily. RED Hearts will be published every Thursday, Saturday, and Sunday through February. Readers can subscribe to the I Heart Daily newsletter for regular delivery of these peer-to-peer style and culture recommendations. Written by a dream team of 58 published teenage RED the Book authors, reporting from New York City to Nevada, Los Angeles to Louisiana, and everywhere in between, RED Hearts provides girls ages 13 and up with recommendations on everything from the original 1960s Agent 99’s “extreme level of awesome” to how you find just the right Bob the Builder-Gossip Girl balance when wearing flannel. rgz TV: two new videos! 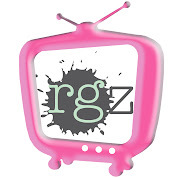 rgz TV is back with two new productions, both from Kidlit Blogger Con 2008! Recommended Reading from the postergirlz! 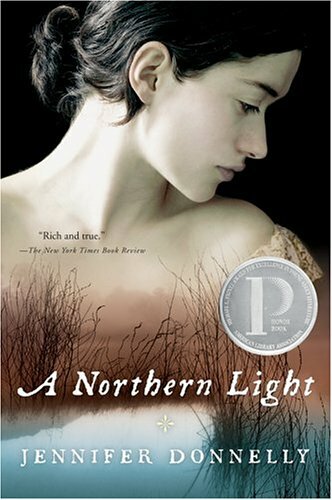 As a compliment to our featured January title, A Northern Light by Jennifer Donnelly, the postergirlz, our fantastic teen lit advisory council, recommend these great reads! "I believe there are few things more scarier than the first time you open the jpeg of your cover. While the saying might be 'don't judge a book by its cover,' I am well aware that is exactly what we tend to do. I wasn't sure what I wanted the cover to look like, but I was certain that I wanted to grab the reader's interest by raising some questions in their mind. If it could raise a question then hopefully the reader would pick up the book. "My editor and the cover designer involved me in the discussion for the cover and even sent some candid photos from the day they did the photo shoot. It was a freezing cold day and they used a hair dryer to heat up the model between shots. There were concerns that because the model was so cold it came across in her expression. When I saw the first draft overall (left) I was fairly happy. I didn't love it, but I also didn't hate it. I've known a lot of writers who had covers that they detested so I felt like the situation was a win. A few weeks later they emailed me again saying they had decided the cover wasn't bang on and they were doing a different version. I chewed down a few fingernails until it arrived. "As soon as I saw the final cover it was love. I love the awkwardness of her sneaking a kiss in the bushes and that she's stepping on his foot. I was thrilled that they went from what was a good cover to one that felt like a great cover." Thanks, Eileen! I love the final cover because I think it conveys the "being bad" side of the story more. What do you guys think? Learn more about The Girl Effect here. In honor of our national inauguration, we're giving away 25 sets of 4 books from Ellen Emerson White's President's Daughter series (Feiwel and Friends) to 25 random commenters! Imagine owning all four of the books in this great series about Meg Powers, the daughter of the first female president of the United States. We featured Ellen on readergirlz in November, and we're so excited to be able to give 25 readergirlz full sets of her fantastic series! So, to enter, just comment below. Say hi, tell us what it feels like to usher in our new president, write a haiku--it all counts. We'll choose 25 commenters on January 31st to win the books, so speak up by then! A Northern Light: The Party! If you're reading A Northern Light, you're probably thinking about friends who'd love it, and how exactly to celebrate this great book! Lucky for you, we have ideas. Food: Lemonade, ice cream, pie . . . and fiddleheads! And don't forget the awesome soundtrack, hand picked by author Jennifer Donnelly! Time to Celebrate North of Beautiful! 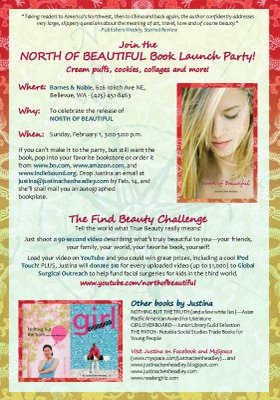 Only two more weeks now before rgz diva and co-founder Justina Chen Headley's third novel, North of Beautiful, hits the shelves, and what better way to celebrate than a party? Why: North of Beautiful, of course! When: Sunday, February 1, 3-5 p.m. If you can’t make it to the party, but still want the book, pop into your favorite bookstore or order it from www.bn.com, www.amazon.com, and www.indiebound.org. Drop Justina an email at by Feb. 14, and she’ll snail mail you an autographed bookplate. Tell the world what True Beauty really means! Just shoot a 90-second video describing what’s truly beautiful to you—your friends, your family, your world, your favorite book, yourself! Load your video on YouTube and you could win great prizes, including a cool iPod Touch! PLUS, Justina will donate $10 for every uploaded video (up to $1,000) to Global Surgical Outreach to help fund facial surgeries for kids in the third world. In case you missed our January newsletter, you might be asking, "What is the rgz Street Team?" So, let me tell you! Postergirl Miss Erin is leading a group of teens for rgz: Traci, Alex, Stephanie (Silence), Sarah, and Vanessa. These are amazing young women who read enthusiastically and participate in our group forum. They each will be bringing YA book reviews to our blogs. Watch these rgz as they REVIEW, RALLY, and RAVE! Thanks to each one, Miss Erin for leading, and diva Melissa who will be posting their reviews. Evie Spooner is fifteen years old, and her stepfather is back from WWII. Suddenly, she is taken by her mother and stepfather to Palms Beach, Florida. Evie and her family meet Peter Coleridge, an ex-GI who served with her father, and she finds herself falling for him. Evie soon learns some secrets about her family from Peter. Then one day, tragedy strikes and Evie must find herself and figure out where her loyalties lie. What I Saw and How I Lied is an amazing coming-of-age novel. It includes such difficult topics as anti-Semitism, Greed, Blackmail, Adultery, and Dishonesty. It is told with vivid imagery; the reader can picture everything. The characters are honest and likable. You will love Evie and her mom. The book is also an addicting and suspenseful ride. The setting is amazing; I felt like I was in 1948. The way that it ends allows room for a sequel and I can't wait for Judy Blundell's next book. This book won the National Book Award for Young Adults, so that's another reason to check it out. Here's something you might want to do with your Saturday: Listen to amazing girls read their works at the Girls Write Now Annual Winter Reading, co-sponsored by the New York Society for Ethical Culture! Join participants in the program for an afternoon with young women writers and the women who inspire them -- including guest speaker Judy Blundell, author of the 2008 National Book Award-winning What I Saw and How I Lied (Scholastic). The evening will feature original collaborative works written and performed by mentor-mentee pairs from the GWN class of 2009. The event is open to the public, and a $10-20 donation to GWN is suggested for admission (though no one will be turned away at the door). The New York Society for Ethical Culture is located at 2 West 64th Street at Central Park West on the Upper West Side. 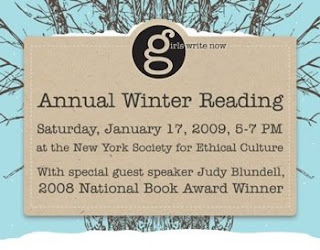 I'll be there, so come say hi, readergirlz! Girls Write Now is a creative writing and mentoring organization for high school girls in NYC. The members are women writers—authors, editors, educators, journalists, playwrights, publishers, advertising and PR professionals, literary agents and more—on a mission to provide a safe space for high school girls to develop their creative, independent voices, explore careers in professional writing, and learn how to make healthy choices in school, career and life. Need more convincing? A good word from The Daily Beast. Little Willow in the world premiere of the musical, Pope Joan! From Michael Butler, the original producer of Hair on Broadway, Pope Joan is the story of a young woman's elevation to the papacy. Here is a controversial story with a cast of 25 and six-piece orchestra. The cast includes Whitney Avalon (Joan), Douglas Barry (Louis II), Cristina Dohmen (Martine), Suzanne Nichols (Lucretia), Bryce Blue (Lucius), Allie Costa (Young Joan), Fernando Orozco, Jr. (Anastasius) and Anthony Gruppuso (Nicholas). Break a leg, Little Willow (Allie!!!!!)! We are so proud of you! Join us for Rgz LIVE! This Thursday! Discuss the book with the author herself! 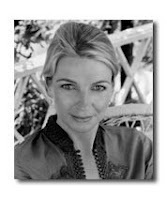 Jennifer Donnelly will be chatting live at the readergirlz forum on Thursday, January 15th at 6 PM PST/9 PM EST. The chat will last for about an hour, and we'll get to ask all kinds of fun questions about Mattie, the main character in A Northern Light, and we can grill Jennifer about her inspirations, writing practices, favorite foods--all's fair game! Release Day for Secret Keeper, by Mitali Perkins! Readergirl Mitali Perkins has a new book out today: Secret Keeper. Here's the fantastic trailer, with Mitali narrating! Book Signing and Chai, Thursday Jan. 15, 2009, 6:00 - 7:00 pm, Not Your Mother's Book Club, Books Inc., Town & Country Village, 855 El Camino Real #74, Palo Alto, CA. Phone: 650-321-0600. Free Writing Workshop, Thursday Jan. 15, 2009, 7:00 - 8:00 pm, Not Your Mother's Book Club, Books Inc., Town & Country Village, 855 El Camino Real #74, Palo Alto, CA. Phone: 650-321-0600. Book Launch Party, Sunday, Jan. 18, 2009, 2 p.m., Bellevue Barnes and Noble, 626 106th Ave. NE, Bellevue, WA. Phone: 425-453-7958. Carrie Jones is a friendly and hilarious author, and she shared her cover story on my blog last week. It sparkled so much, I had to show the readergirlz! NEED, Carrie's latest release, is about a girl named Zara who's had a rough life and who collects phobias. She thinks her grandmother's instinct to keep her safe in their sleepy Maine town is just silly--but she's wrong. Turns out that guy Zara sees everywhere, the one leaving trails of gold glitter, isn't a figment of her imagination. He's a pixie--and not the cute, lovable kind with wings. He's the kind who has dreadful, uncontrollable needs. And he's trailing Zara. "I am a total dork when it comes to imagining covers. Honestly, I don't even think about the cover of any of my books when I'm writing them. It's like I would jinx the whole story if I actually imagined a real-live cover. I don't even think about it as a book really when I'm writing and revising. I just think of it as a story. "The good thing about big dogs is that they don't mind when you faint on them. "When I talked to my editor, Michelle Nagler, about the cover, she said: Do you think it's creepy enough? "And Michelle said: I think the branches should extend, don't you? "And Michelle said: Carrie? Carrie? Are you there? Do I need to call 9-1-1? Do they have 9-1-1 in Maine? "From the original version, the cover became a little more creepy. Michelle had them extend the naked tree branches up a little bit. It was even more beautiful/cool/creepy in real life than it was on the jpeg image. "If I could marry my cover, I would totally marry my cover, which probably means I'm a sucker for beautiful, tantalizing creepy things." And I am a sucker for glittery gold lipstick. What do you guys think? On the nightstand: Wodehouse and Beckett. The first makes my laugh till I cry. The second makes me cry till I laugh. Favorite bookstore: All of them. Every single one on the planet. Pets: My beloved greyhound, Scotty. Place to write: My quiet, serene, light-filled office in a cottage on a horse farm in the country. No phone, no e-mail, no FedEx or DHL or UPS. Bliss! Inspiration: The brawling, sprawling, appalling mess that is history. Dream book tour: One that starts in the Balkans and ends up in Tibet. Writer buddies: Just met Valerie Martin. She's so cool. She's scary-smart, but for some reason, she still hangs out with me. Cure for writer's block: Writing. Cringe, cry, swear, scream, threaten suicide, but keep on writing. Favorite outfit: Levi's and Blundstones. And a shirt of some nature. Come join us in the rgz forum to find out more about Jennifer! During these challenging economic times, readergirlz continues to believe books offer hope and consolation. Now, more than ever, hospitalized teens need the escape and inspiration they get through reading quality young adult literature--books with exceptional characters and fabulous stories. That's why rgz is kicking off its second annual Operation Teen Book Drop with YALSA and GuysLitWire. (TBD '09) Click here http://readergirlz.com/tbd.html for last year's overview. rgz is now accepting book donations from publishing houses for hospitalized teens across the country. If your publishing house is able to donate 500 copies of appropriate young-adult novels, non-fiction, or audio books, please contact rgz diva Dia Calhoun at diacalhoun@msn.com Thank you for reading, reflecting, and reaching out! Author Sonya Sones is pretty awesome, and her book What My Girlfriend Doesn't Know just came out in paperback! That's good news, but even better is that Sonya's publisher is hosting a writing contest in which the winner gets a free six-week online writing class from Gotham Writers' Workshop! Plus their entry will be posted on Sonya's website. 10 Runners up get a subscription to Teen Ink magazine and an autographed copy of the book. How cool! The contest is here. Good luck! "I have read so many books, and not one of them tells the truth about babies. Dickens doesn't. Oliver's mother just dies in childbirth and that's that. Bronte doesn't. Catherine Earnshaw just has her daughter and that's that. There's no blood, no sweat, no pain, no fear, no heat, no stink. Writers are damned liars. Every single one of them." I love this so much! And then the following passage about Minnie giving birth is incredibly real. Certainly in 1906 writers were restrained, especially in their portrayal of women. Thankfully, we are not so inhibited today. Although there still are a few harnesses left for writing YA, and certainly many more are in place for middle grade novels. Despite those, I have a driving aim to tell the raw truth. Truly, that was my goal for Loose Threads. But even when we bust through barriers with publishers, we can still be held back. I was asked at a school visit for Loose Threads not to mention the word "breast" when discussing breast cancer with the fifth graders. I'm-not-kidding. May we female writers push to tell our stories. Without one lie. To everyone who will listen. Lisa McMann's bestselling WAKE is about a girl named Janie who falls into other people's dreams. No spoilers here, but the series is a ton of fun, and book 2, FADE, is out in February. Janie herself has big dreams--mainly she thinks about college--but she doesn't have the money to make her dreams come true. What is the Greatest Obstacle You’ve Overcome? Lisa will choose a winning 500-word essay, and the winner will receive $1000 toward meeting his or her life goals! The contest is going on now, so click to read the full rules, and it ends on March 6th, 2009. Go for it, readergirlz! P.S. If you're interested, I've posted my Best Books of 2008 list over at my blog. Let me know what you think! Earlier this week on melissacwalker.com, Laurie Stolarz shared the Cover Story behind her latest release Deadly Little Secret, which Kirkus Reviews says has "CW-worthy dialogue." It's the first in her Touch Series, and I wanted to share it with readergirlz! Here's a little bit about the book: Until three months ago, everything about sixteen-year-old Camelia's life had been fairly ordinary: decent grades; an okay relationship with her parents; and a pretty cool part-time job at an art studio downtown. But when Ben, the mysterious new guy, starts junior year at her high school, Camelia's life becomes far from ordinary. Rumored to be somehow responsible for his ex-girlfriend's accidental death, Ben is immediately ostracized by everyone on campus. Except for Camelia. She's reluctant to believe he's trouble, even when her friends try to convince her otherwise. Instead she's inexplicably drawn to Ben...and to his touch. But soon, Camelia is receiving eerie phone calls and strange packages with threatening notes. Ben insists she is in danger, and that he can help--but can he be trusted? She knows he's hiding something...but he's not the only one with a secret. "My editor e-mailed me a picture of the jpeg. As soon as I saw it, I loved it. It's probably my favorite cover yet. I love the color scheme. And I love how the girl's hand is sort of translucent, lending itself to the topic of psychometry (the ability to sense things through touch). One of the main characters in Deadly Little Secret has this ability, and this mystical touch really works well, I think, without being too fantastical or overdone. I asked my editor how the cover came to be and she said the art person was really inspired and the cover came together really quickly. Everyone was pleased with it, including me." Sometimes a Cover Story is just that short and sweet! I love this cover, because I think the flowing dress is just perfect, the grassy/mossy ground with her bare feet in it looks somehow both soothing and scary, and the treatment of the title--with the illustrated lace frame--is just gorgeous. Laurie's also running a great contest on her blog--think of a soundtrack for the book and you can be entered to have a minor character in Deadly Little Lies, the second book in the Touch Series, named after you. That would be cool. I am proud to once again be a member of The Cybils Young Adult panel. This year, I'm one of the YA judges, along with Jackie from Interactive Reader (and a fellow member of postergirlz! ), Sarah from Finding Wonderland and Readers' Rants, Lili from Inside a Dog, and Casey from Avid Teen Reader. Many thanks to the hardworking YA nominating panel, who read over 100 nominated titles and narrowed the field down to seven. I've listed the finalists alphabetically by author's last name. Summaries are my own. Recommended in the October 2008 issue of readergirlz! Behind the music: How life changes for a feisty teenage girl when her ex-boyfriend writes a chart-topping song about their breakup. The story of a young taxi dancer in the 1940s. I will be reading this book in the coming weeks. E. Lockhart was one of three authors spotlighted at our Summer Sizzle chat in June 2008! A clever teenage girl secretly leads and manipulates a boys-only secret society at her prep school. Five teenagers, brought together by tragedy, are later torn apart. Twenty-two years later, the fallout reaches a young woman who is struggling to put the pieces (of memory, of story, of life) together. Recommended in the August 2008 issue of readergirlz! The return of a childhood friend makes a teenaged girl re-examine something horrible that happened when they were kids. After breaking up, a teenage couple must deal with an unplanned pregnancy. A young man battles Guillain-Barre Syndrome. The winners in all categories will be announced February 14th. Help us welcome the fabulous Jennifer Donnelly! In A Northern Light, Sixteen-year-old Mattie Gokey has big dreams but little hope of seeing them come true. Desperate for money, she takes a job at the Glenmore, where hotel guest Grace Brown asks her to burn a bundle of secret letters. But when Grace's drowned body is fished from the lake, Mattie discovers the letters reveal the grim truth behind a murder. Set in 1906 against the backdrop of the murder that inspired Theodore Dreiser's An American Tragedy, this astonishing novel weaves romance, history, and a murder mystery into something moving, real, and wholly original.